The Capercaillie Framework pulls together all the information relating to capercaillie distribution, the pressures they face and management measures. Thanks to generous support of the Heritage Lottery Fund, the Cairngorms Capercaillie Project is now delivering key recommendations from the framework related to population monitoring, habitat creation, sustainable recreation planning and work enabling communities to make decisions and take informed action for capercaillie. Capercaillie populations in Scotland have declined significantly from an estimated 20,000 birds in 1970 to 1,114 at the most recent national winter survey in 2015/16. The Cairngorms National Park holds a significant proportion of the national population – around 80% with the vast majority in Strathspey. Although capercaillie numbers have held up in Strathspey, the population is now extremely vulnerable elsewhere. Capercaillie persist in other areas (Deeside, Donside, Easter Ross, Moray and Perthshire) but these populations are more fragmented, numbers are lower and breeding success poorer. The Strathspey capercaillie population is crucial to the long-term survival of the species in the UK. This places a significant responsibility on CNPA and our partners to take a strategic approach to management for this population and work at a landscape scale if we are to save this species. 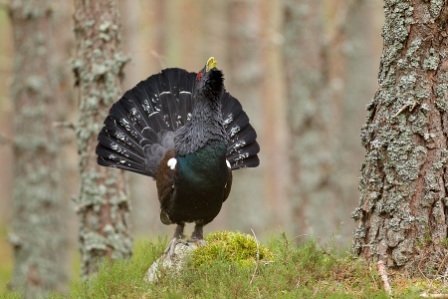 The capercaillie decline is thought to be caused by a number of cumulative reasons including loss of suitable habitat or woodland management that has not favoured the species, bad weather, predation, collisions with deer fences and disturbance. With capercaillie populations at such vulnerable numbers, any factors that could impact on the breeding success of individual birds could have significant impacts for the population as a whole. identifies what else we may need to do, where we may need further investment or resources and highlight the future agenda for management action. View the report from phase 1 and summary infographic. The Capercaillie Framework has been led by CNPA working closely with partners and is overseen by a Project Board chaired by CNPA and comprising senior staff at RSPB, FCS, SNH, SportScotland and private estate representation. Working on a more technical level, a Project Team was established for working on the data and analysis. This Team includes the Capercaillie Project Officer and Project Assistant, RSPB, FCS, SNH, GWCT and CNPA staff. The work has also been guided by advice from the Cairngorms Local Outdoor Access Forum, Cairngorms Nature Strategy Group, Capercaillie BAP Group, CNPA Board and additional input from a wide range of advisory forums.